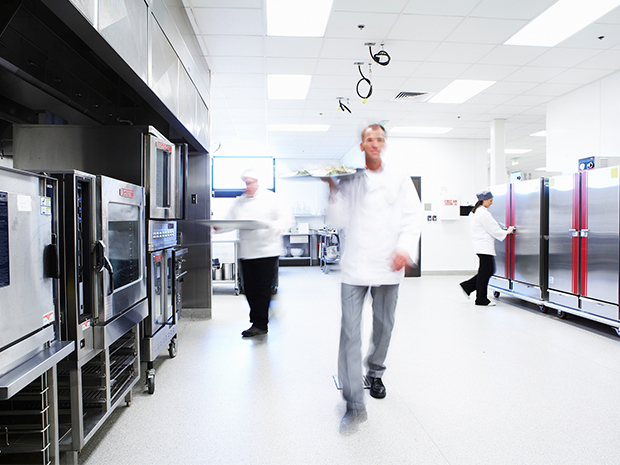 It’s common industry wisdom that foodservice directors should spend between 20 to 25% of total sales on labor costs. Any lower, and customer service or product quality could suffer. Sneak above that number, and the budget may not be able to sustain the expense (and employees might be sitting around without much to do). However, sometimes directors have to make hard decisions on how to condense labor costs without making any sacrifices to safety, food quality or customer services—all pillars of a foodservice operation. It’s not an easy task, but by implementing a few hacks—that is, embracing services and equipment available, as well as taking a hard look at employees’ skills and current processes—directors can figure out how to fit it all into the labor budget without any guests noticing the difference. Any smart business person knows that employees can make or break the operation, and that’s why a thorough interview process is so important. It’s vital to not only hire someone with a strong work ethic and the necessary knowledge for an organization, but also someone who can successfully multitask. These staffers are the ones who are going to save time and money by being able to juggle multiple duties and play a role in various parts of the operation. During an interview, ask a potential employee about their experience in multitasking, asking them to give specific examples of when they worked on several projects at one time. Then, once the right person has been hired, ensure they are cross-trained in various parts of the business. When employees know how to work in a variety of areas, there is more flexibility in scheduling and it allows the employees to be more efficient when switching from role to role. That flexibility and efficiency can save on labor costs. Rather than copying and pasting schedules from week to week, take a careful look at what labor is needed and why. Review last year’s sales and guest counts from the same time period and create a calendar that notes when there might be special events that will require extra staff. Coming full circle, take advantage of technological advances in scheduling with an online system that allows operators or managers to post schedules online, so employees can review them in advance. Then, employees can swap or pick up shifts, coming to the manager online for approval, which removes the time cost of last-minute staff shortages or messy in-person shift swapping. Kitchen technology has come so far, and yet sometimes operations don’t advance, simply because it’s easy to keep doing what’s always been done. Take some time to research companies that can help save time and money in the labor department. For example, Restaurant Technologies simplifies a process that hasn’t changed in decades by providing the technology and service of Total Oil Management. With this service, the company puts in a set of tanks—one for fresh oil and one for waste oil—and the fresh oil is pumped to the fryer. When that oil has been used up, the waste oil is pumped back into the second tank, which is plumbed to an outside wall. Trucks service those tanks as needed, replenishing the fresh oil and taking away the waste. No longer will employees have to schlep oil to and from the fryers or dangerously try to remove old oil, which could save a minimum of 30 minutes of labor each day—maybe more for bigger operations. There is also a portable oil system for large and unique footprints such as colleges, hotels, hospitals and other non-commercial businesses. Additionally, automating this process is safer. Mike Foster, Senior Director, Non-Com and Hospitality at Restaurant Technologies, says, "If you don’t have a closed loop bulk system, you’re throwing oil away manually. That could entail dumping it into pots or shuttle systems. Those take time and are dangerous."